Quasar01493 332656work Corporate EntertainmentQuasar at The Mint, on Great Yarmouth seafront, is an unusual alternative if you're looking for seriously competitive corporate entertainment for 2 - 30 players. An amazing atmosphere for an unforgettable experience. 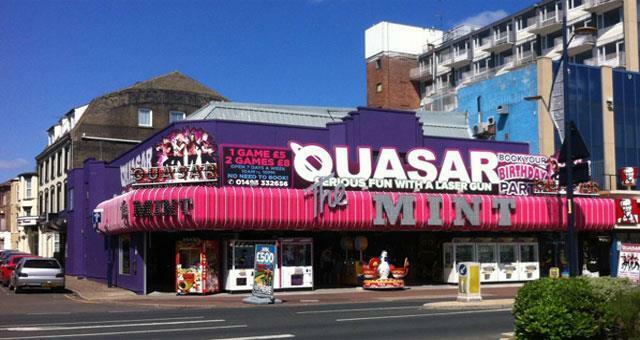 Quasar at The Mint, on Great Yarmouth seafront, is an unusual alternative if you're looking for seriously competitive corporate entertainment for 2 - 30 players. An amazing atmosphere for an unforgettable experience. Open 10am to 10pm daily (closed Christmas Day). Christmas Eve and New Years Eve from 10am to 6pm. On arrival in Great Yarmouth follow signs for the Seafront, taking a right turn at the mini roundabout onto Marine Parade. 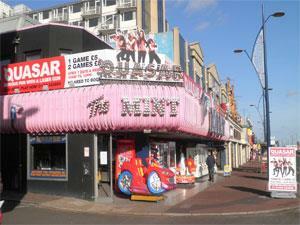 Quasar is located within The Mint amusement arcade, mid-way along Marine Parade opposite the Marina Leisure Centre.